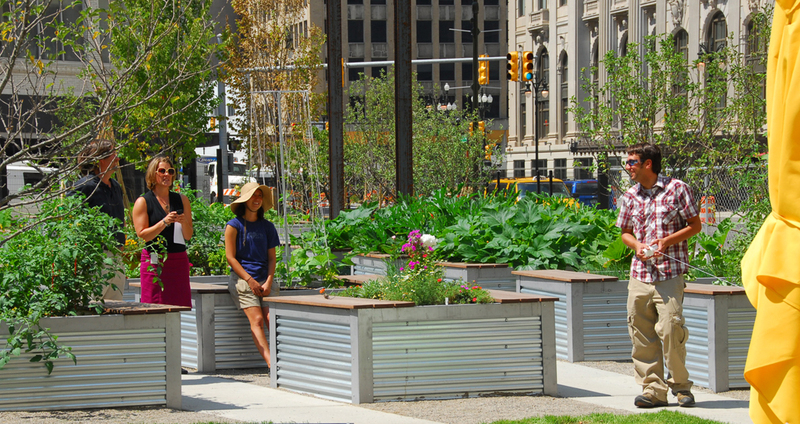 These are the 3 key concepts we had in mind when Compuware Corporation approached us in the fall of 2010 with the idea of an urban garden in downtown Detroit. 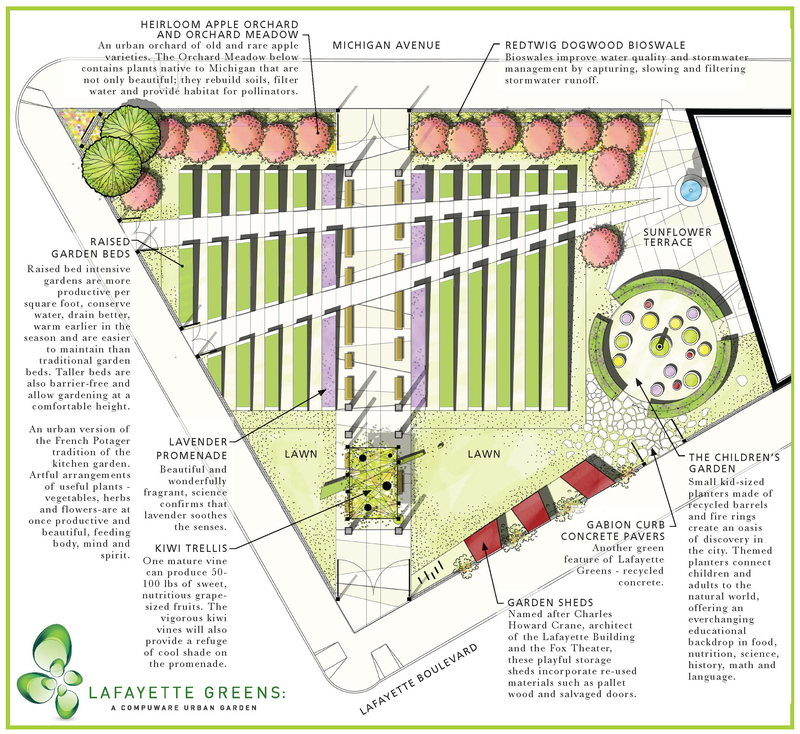 Built on the vacant site left when the historic Lafayette Building, designed by C. Howard Crane, was demolished in early 2010, Lafayette Greens is an organic vegetable and fruit garden right in the heart of the city. For KWLA, the project has been an exciting opportunity to explore design possibilities for productive urban landscapes and to re-imagine urban agriculture as a new kind of urban place that enriches and enhances the urban experience. 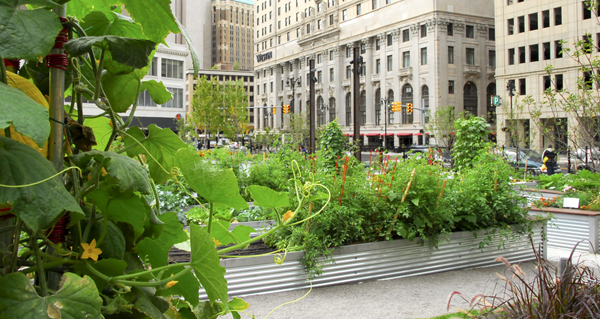 Producing fresh food in our cities, right where we live and eat, has the potential to bring together green space, public space, public health, community engagement and sustainability. 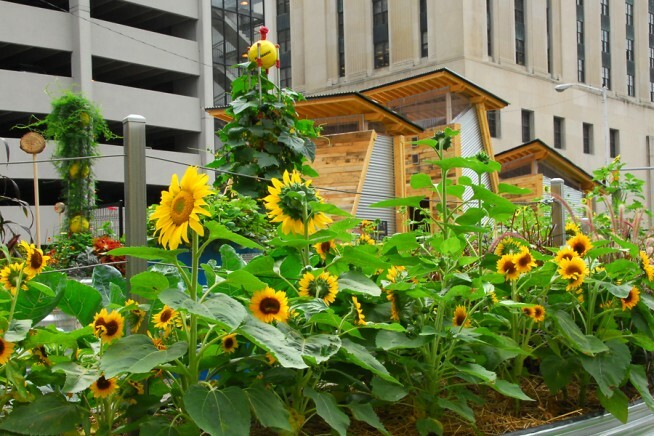 Growing fresh organic produce in our cities and neighborhoods is an urban experience that is not only pleasurable and therapeutic for ourselves as individuals – but also gives us the opportunity to reconnect to our food, our neighbors and the environment that sustains us all. 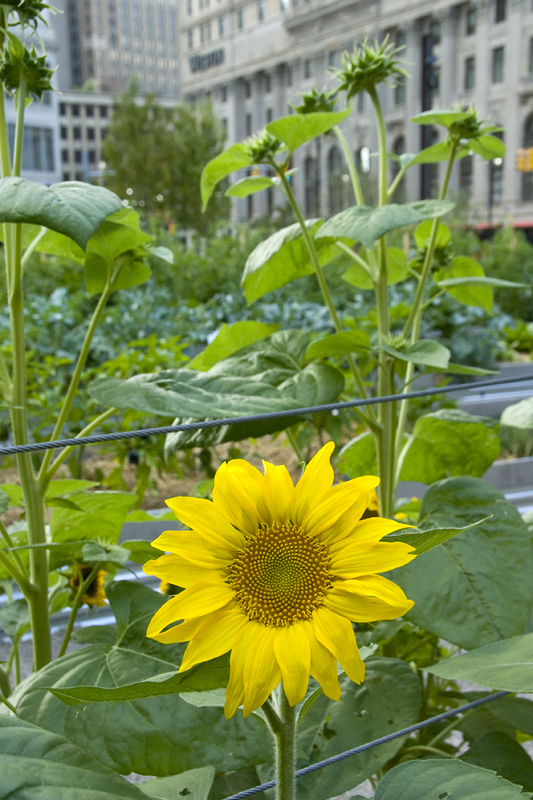 The idea to create an urban garden came from Compuware’s founder and executive chairman Peter Karmanos Jr., a master gardener himself and a great supporter of Detroit. 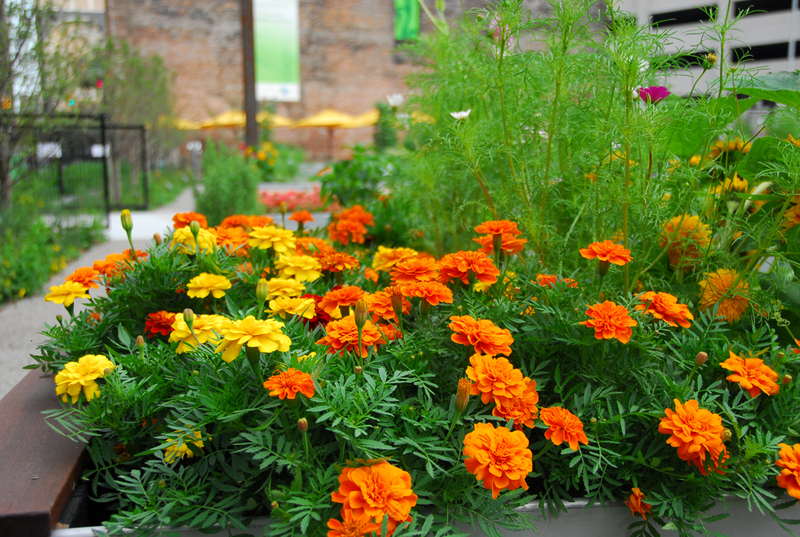 Envisioned as a place for Compuware employees to be active and invested participants in downtown Detroit and as an expression of Compuware’s culture of giving back to the community, Lafayette Greens is tended by Compuware volunteers and fellow city dwellers. Produce from the garden is donated to Gleaner’s Community Food Bank. Megan Heeres, Art Curator and Community Art and Garden Program Manager was the person at Compuware tasked with carrying out the project. Locating the garden near the Compuware headquarters so employees could easily enjoy and participate in the garden was a priority. Several sites in the downtown area were considered and the vacant lot at W. Lafayette and Shelby was the final choice. 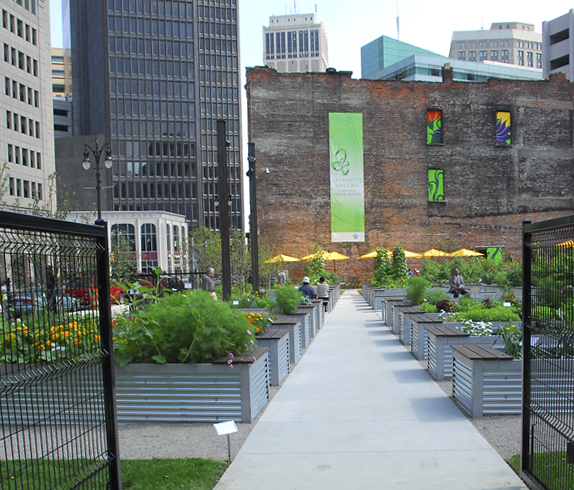 Heeres was instrumental in negotiating a lease agreement with Detroit city officials – a great example of a cooperative effort between the private and public sectors that has resulted in a very positive and productive use of a vacant parcel of land in the city. In this blog, we’ll be telling our story of how the garden was designed, built, growing and productive in less than a year’s time. Although Lafayette Greens will never produce enough food to feed a whole city – because of it’s highly visible location and because it serves as a public and community place that engages people – it is in a position to serve as a focal point and educational space; a backdrop to an expanded conversation about the urban food movement and its potential for enhancing city living, changing our food system, and addressing urban sustainability and food security issues. 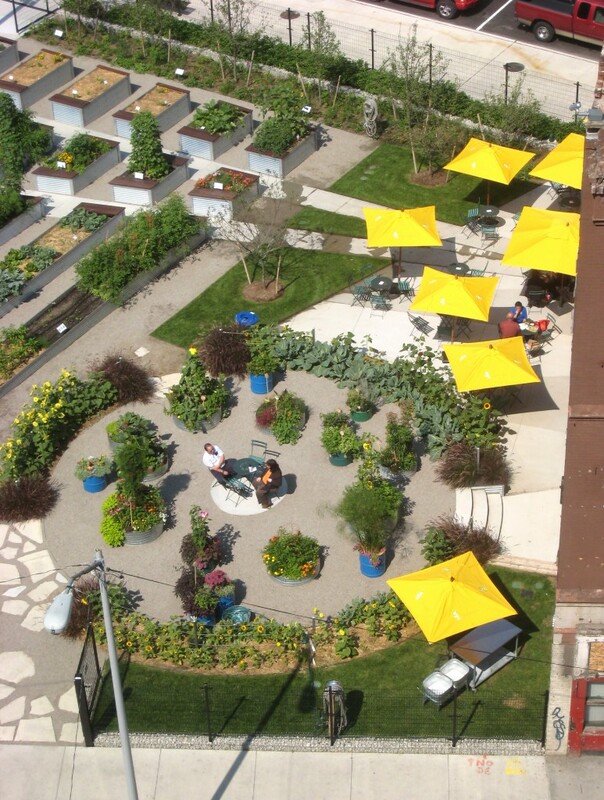 Lafayette Greens is an urban garden that includes an Heirloom Apple Orchard, Short Orchard Meadow, Bioswale, Lavender Promenade, Hardy Kiwi Trellis, Materials Reuse. 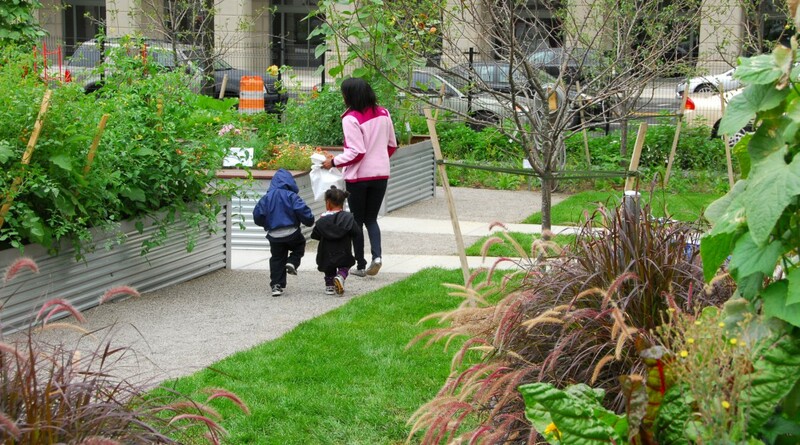 a Children’s Garden and plenty of benches and seating to make it a great public space. 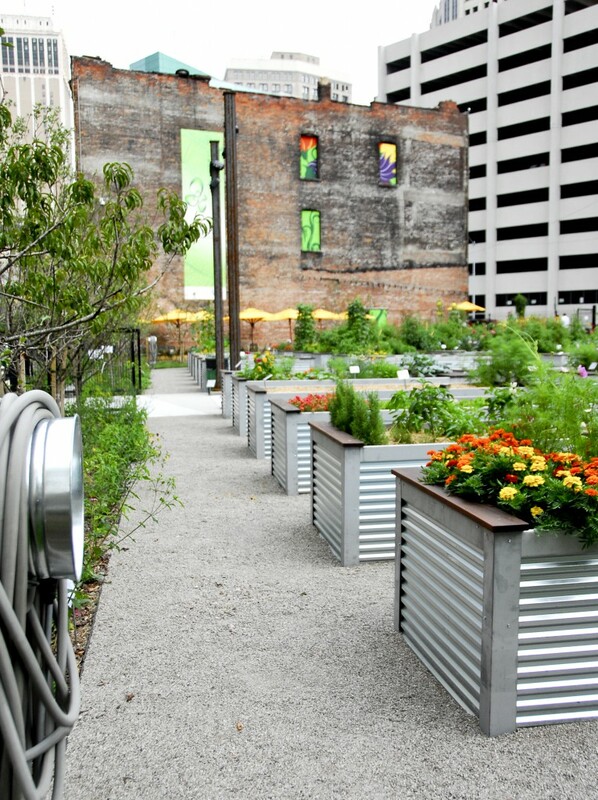 Lafayette Greens is an amazing urban garden! GREAT DESIGN…thank you Beth and Ken for sharing your talents! I am looking forward to visiting the garden in each season! It is PRODUCTIVE, BEAUTIFUL and INSPIRING! Previous post: Why the Volcanoes?